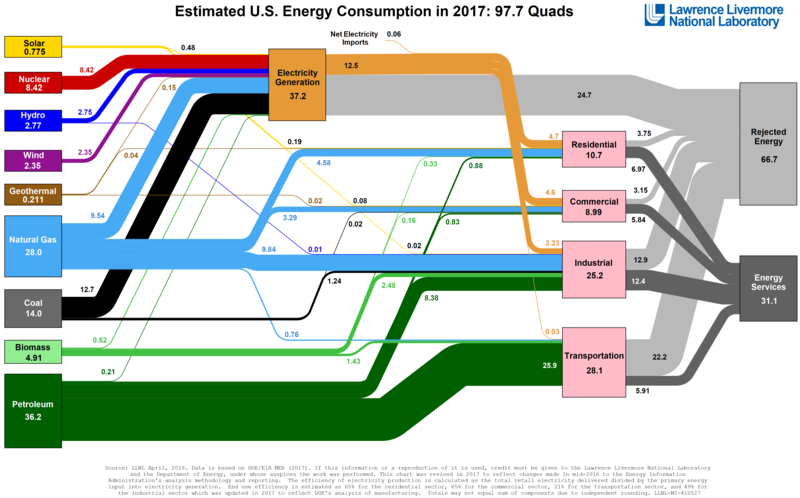 Every year, the Lawrence Livermore National Laboratory, a federal research facility funded by the Department of Energy and UC Berkeley, puts out a fascinating Sankey diagram that shows the fate of all energy that gets generated and consumed in the United States in a given year. Today’s visualization is the summary of energy consumption for 2017, but you can see previous years going all the way back to 2010 on their website. As Visual Capitalist's Jeff Desjardins explains, the first thing you’ll notice about this Sankey is that it uses an unfamiliar unit of measurement: the quad. 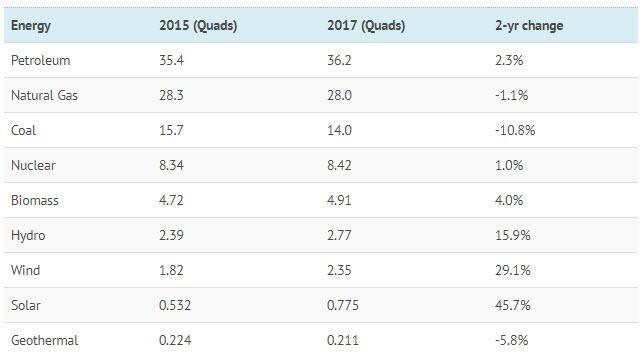 Put another way, a quad is a massive unit that only is useful in measuring something like national energy consumption – and in this case, the total amount of energy used by the country was 97.7 quadrillion BTUs. On the diagram, one thing that is immediately noticeable is that a whopping 68% of all energy is actually rejected energy, or energy that gets wasted through various inefficiencies. The transportation sector used 28.1 quads of energy in 2017, about 28.8% of the total consumption. However, it wasted 22.2 quads of that energy with its poor efficiency rate, which made for more rejected energy than the other three sectors combined. This wastage and inefficiency in the transportation sector provides an interesting lens from which to view the green energy revolution, and it also helps explain the vision that Elon Musk has for the future of Tesla. The last time we posted a version of this visualization was for the 2015 edition of the diagram, and we noted that renewables had a ways to go as a factor in the whole energy mix. As you can see, solar and wind consumption are jumping considerably – but in absolute terms, our note from two years ago still remains true. To make the desired impact, renewable energy still has a ways to go.